Instead of going into a tailspin trying to get your house looking festive this year, bring some Thanksgiving flair to your home with creative and easy-to-make corncob decorations. Indian corn brings autumn inside as it draws out and highlights the other colors in your holiday decor. With a few minute's time, a little ingenuity and some craft-store supplies, you can kick-off this year's holiday entertaining season with style. 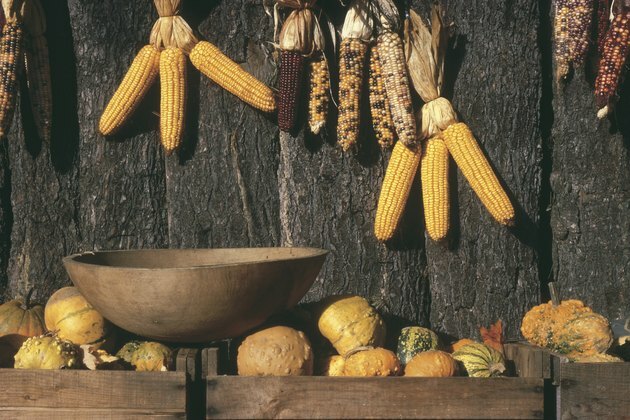 Corncobs add an Autumn feel to holiday decorations. Spread newspaper across a table or flat surface to make cleanup easy after you finish your project. Gather your ingredients together and lay them where you can easily access them. Arrange the flowers in a way that appeals to you. When you are satisfied with your arrangement, bind them together by wrapping florist tape around the bouquet about halfway up the stems of the flowers. Compare the flower stems to the length of the corn husks. If the husks are longer than the stems, cut the husks so the flower stems are just slightly longer than the husks. Arrange the corncobs so that they face down and the husks point up to form a vase for the bouquet. Put the bouquet into the arranged corn so that the husks cover the flower stems. Take the craft wire and wrap it once around the husks with the flower stems inside. Cut your wire with wire cutters, leaving it just a bit longer than you need. Twist the wires together and create a small loop in the back of the arrangement so that you can hang it. Cover the wire by tying a bow around the husks.